The Roys And Vietti Foods Extend "Vietti Vinyl" Campaign To "Family Style Beef Stew"
Elaine Roy, Vietti Foods Company, Inc. President Philip M. Connelly and Lee Roy. 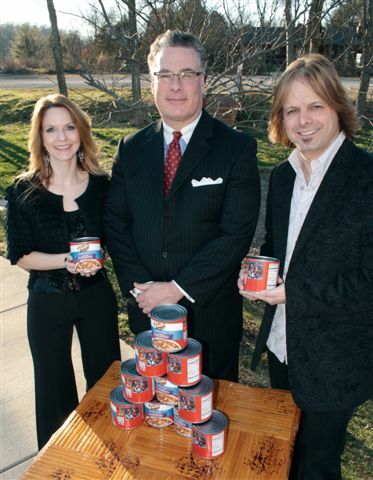 Nashville, TN (January 11, 2012) -- The award-winning brother/sister duo, The Roys, will join Vietti Foods to extend the Vietti Vinyl campaign, with the duo's image appearing on 500,000 cans of the brand's Family Style Beef Stew in Family Dollar stores in 25 states throughout 2012. The Roys are the first artists to grace the Beef Stew can labels; Vietti Chili line participants include: Chris Young, Bo Bice, The Isaacs, John Corbett and Riders In The Sky. The Vietti Vinyl initiative gives voice to musicians, and gives consumers a chance to spice up their music collection, sample new sounds and videos. "Our company is highly selective in choosing the artists who participate in the Vietti Vinyl program," says Philip M. Connelly, President, Vietti Foods Company, Inc. "And we are very enthusiastic to partner with The Roys. Fans should expect to discover them on another line of our products in the near future." "We are beyond excited to join the Vietti Family," says Elaine Roy. "The company is dedicated to the creation of a superior product and active in several charities." The Roys, spokespersons for COMPASSION INTERNATIONAL, believe in giving back. They are also uniquely qualified to act as ambassadors for their genre. Two-time ICM Duo of the Year (2010, 2009), they were named the organization's Inspirational Bluegrass Artist of the Year in 2011. Their current CD, LONESOME WHISTLE, continues to bring them not only critical acclaim, but retail success as well, and the disc earned them a spot on BILLBOARD'S Top 50 Bluegrass Albums of 2011 chart. As well, their hit single, "Coal Minin' Man," rocketed up the Bluegrass charts worldwide. Recently, Lee and Elaine signed a production deal with ValCom Studios for a new, weekly music-driven variety show (Roots And Music With The Roys), which begins taping next month. "The last few years have been incredible for us," explains Lee Roy. "Teaming with Vietti in 2012 gives us the chance to expand our music to new markets through the Vietti Vinyl project. We are truly excited about this opportunity." Massachusetts natives Lee and Elaine Roy are both accomplished musicians (Elaine/guitar; Lee/drums, bass and mandolin), but they are best-known for their superb harmonies, "Rootsy" sound and compelling original songs. They've toured extensively throughout the U.S. and Canada, and last year they appeared on high-profile television shows on ABC, FOX, GAC, RFD and more. Later this month, the duo heads to Australia for a series of concerts and festivals. www.theroysonline.com . Vietti Foods Company, Inc. (formerly Choice Food of America LLC) is a manufacturer and marketer of shelf-stable food products under its own brands, contract brands, private label and licensed brands. The company produces and merchandises a broad variety of products to supermarkets, mass merchandisers, drug and dollar stores for U.S. distribution and for export. Founded in 1898, Vietti originally incorporated as a Nashville-based company in 1936 and remained under family and management ownership until it became a part of Choice Food Group, Inc. in 2006. In March 2011 the Nashville operation was acquired by Zwanenberg Food Group BV, based in Almelo, The Netherlands. With 1,300 employees and net sales of EUR 350 million, Zwanenberg Food Group (ZFG) is a prominent European producer of deli meats and a leading producer and exporter of meat preserves. www.viettifoodsinc.com.